This week I am super excited for War Storm by Victoria Aveyard! I have devoured the previous books in the Red Queen series and I can't wait to see how it all ends! While Mare hasn't always been the most inspiring heroine, she has shaped up nicely. I'm also super annoyed at Cal at the moment, even if he thinks he had to do what he did. Partly because of that, I'm really hoping for a girl-power team up between Mare and Evangeline! 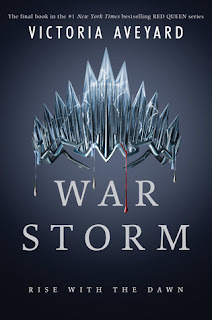 What hopes/predictions/worries do you have for War Storm? I'm currently listening to King's Cage and really into it so I hope to finish up before this comes out!